← Holy Motors (2012) – Who Were We? If The Fan was a baseball legend, it would be Barry Bonds. 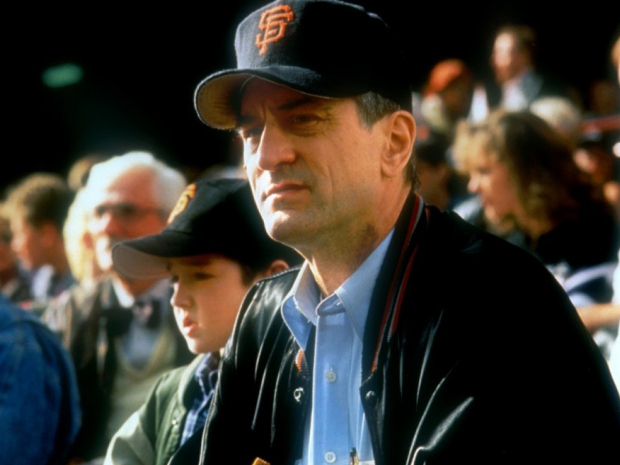 The film has various similarities with his stint at San Francisco, which include record-breaking contracts, shirt number confusion and of course, the Giants themselves. This Tony Scott picture delivers a sleek first pitch followed by an unexpected knuckleball. Gil Renard (Robert De Niro (Goodfellas, 1990)), A down-on-his-luck knife salesman, goes round the twist whilst stalking his idol, baseball legend Bobby Rayburn (Wesley Snipes (Blade, 1998)). With a Falling Down (1993)-esque feel, De Niro’s steady decline of realism is well played to the best he can. Snipes fits the bill as the arrogant player and it is probably his best performance alongside Murder at 1600 (1997). De Niro’s character stops at nothing to keep his idol’s credibility in check, to the point of no return following a bizarre jinx over Snipes losing his shirt number. Unable to perform and hit, Rayburn’s frustration is felt, generating more tension than a fat mans belt buckle. This results in a complete meltdown from Renard. Renard’s patience is tested throughout the course of the flick. As neck-cracking and collar-pulling are not usually associated with De Niro’s persona since the early days, it was refreshing to experience another one of these roles from the acting hall-of-famer. Benicio Del Toro (Fear and Loathing in Las Vegas (1998)) fits into place nicely, as the irritating ex-centre fielder who steps up to the plate when Rayburn loses his metal. On the downside, the film tends to drag somewhat. The ending feels slightly rushed and the acting from Patti D’arbanville (nothing else of note, for obvious reasons) is totally dreadful. Apart from that, Snipes is marginally better than usual and although it is not De Niro’s best work, I enjoyed this film somewhat. With a haunting Hans Zimmer soundtrack and supporting cast of John Leguizamo (Carlito’s Way (1993)), and Ellen Barkin (Ocean’s Thirteen (2007)), to keep you interested, The Fan is a steady thriller. Give it a chance and you may be more suprised than not getting socks at Christmas from Mummy. Performance of the film – De Niro’s performance pushed me to more lip biting than a nuts/fly encounter on a cold day. He did his best within the role, slightly overshadowing Snipes’ stupid slugger act. Quote of the film – De Niro’s powerful one liner “Some people are ungrateful…and they should be taught a lesson” lingers in my head. Fact of the film – This is the second movie where the De Niro/Baseball bat/head cracking combo is in full swing. Soundtrack/score – A nice selection of tunes ranging from the Rolling Stones to Terence Trent D’arby. Add that to a polished main suite from Hans Zimmer and you have a better bundle than a top-notch mobile phone package. May be a miss for some but it struck a chord with me. A decent batting average. 77/100. Movie genius with ocd from england, Here we write mini movie segments with the aim of a slight chuckle from quickfire reviews. Posted on 10/02/2013, in Entertainment, Film, Movies, Reviews, Sport, Thriller and tagged Benicio Del Toro, Hans Zimmer, Robert De Niro, Wesley Snipes. Bookmark the permalink. Leave a comment.